Email marketing automation can be used in every stage of the marketing and sales process. It provides support with demand generation, sales and in retaining existing customers. After selecting your new email or marketing automation vendor comes the implementation. Find out how you can continuously refine your campaigns and increase conversion in 6 steps. Selecting your new email marketing automation vendor is only the first part and implementation and refinement as just as important. You want a good overview of the entire process. This makes for better requirements, planning, budgetting and management of expectations. So what are the steps we are talking about? Make sure you find out the prospect’s email address or mobile phone number, followed by their name and gender. For B2B companies, a job title is also useful information. After all, every member of the decision-making unit (DMU) has an appetite and interest in different types of information. Don’t ask for any information you don’t plan on using. Nowadays, street addresses are no longer as relevant as they once were. Knowing what someone’s problem is, and how your product or service can help solve said problem, is much more important. If people sign up for your newsletter, don’t immediately bombard them with questions. You have to tempt them, offer them something that will make them leave their contact details. Gradually asking them for more information during the customer journey is usually better. In doing so, you prove to them that you can provide actual added value. Progressive forms are an excellent tool in that regard: you display the data you already have and only ask for additional information. Decide what information you are going to send, which target groups to send it to, and in what order. Also determine your follow-up actions: how do you respond to a customer or prospect’s particular action? In doing so, you can define the course of the processes you plan on automating. But don’t forget the creative part. Emails are just a tool used for creating engagement. What really matters is content. What kind of subject is catching on? How do you get your message across? What is the call to action? The beauty of email marketing automation is the fact that a simpel A/B test already tells you what message works best for a certain segment. Measure what people do in response to the information you send them. What messages in your newsletter are they reading? Who is clicking the link to your website? What pages are they viewing? Knowing this information allows you to continue building your customer profiles. It provides you with valuable insight into your customers’ interests, as well as what kind of communication they prefer. What type of communication leads to higher response rates? What content in particular do they think is interesting? This allows you to make your communication even more relevant. Start simple, or further segmentation and offering relevant content will become too complex. You can grow towards email marketing automation maturity. Using the data you gathered in step 1, it is often possible to make a rough target group division. You can further refine that division based on your prospects’ or customers’ behaviour. Their online search and navigation behaviour usually shows pretty clearly what products or services they may be interested in. You can also enrich profiles with information you acquired through additional communication. Again, it is best not to start with too many segments at once, in the interest of keeping your activities manageable and monitoring your results properly. As soon as you have ‘proof of concept’, you can demonstrate that investment in marketing automation will pay for itself. You’ve already developed campaigns based on the rough target group division in step 2. Marketing automation helps you in easily refining those campaigns and tailoring them to the desires of a specific customer or prospect. You can do so with dynamic content: you determine beforehand which content is suitable for which segment, and your software will compile the newsletter accordingly. 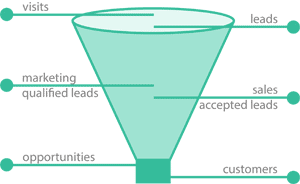 Distinguish leads based on their current stage in the process. Determine the marketing qualified leads (MQLs) and when they are suited to be handed over to sales, in order to become sales qualified leads (SQLs). Determine the criteria that MQLs or SQLs must meet. You can assign scores to certain criteria (job titles or organisation size) and activities (opening an email or visiting a webpage). Based on those scores, leads are automatically categorised, based on which the content to be sent is filtered. By involving sales throughout the entire process, you ensure that all goals are aligned, and sales will also be more committed when following up on leads. Measure which target groups respond more positively to a certain type of promotion over others. Determine the point at which people leave during the marketing and sales cycle, and map the campaigns and promotions that perform best. You can use that information to further fine-tune follow-up campaigns and to determine the necessary budget. Comparing campaigns is a good idea as well. 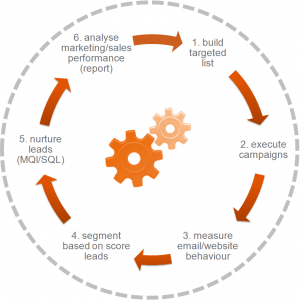 Marketing automation helps you to make marketing accountable. Identify which key performance indicators (KPIs) contribute to the success of your campaigns, such as the online navigation behaviour of email recipients, your database’s vitality (who is active, who never responds) and the worth of email recipients. Only measure the KPIs you actually plan to focus on and that you plan on using to adjust your future campaigns. Having a solid understanding of the entire process of marketing automation is required even before starting. Be sure to get an improvement plan in place that encompasses all the six steps.